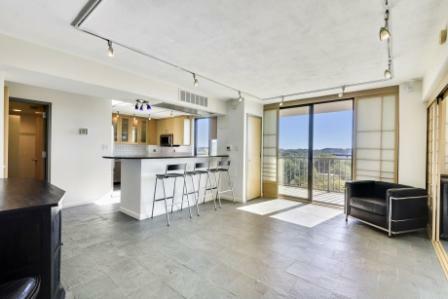 Chic and modern 2BR/2FB completely RENOVATED and reconfigured condo by owner/architect. This absolutely stunning one-of-a-kind unit features approximately 1,200 sq. ft. of living area. Spacious and open floorplan with Vermont slate floors throughout and breathtaking sunrise views from balcony. Gourmet custom kitchen with solid maple cabinetry, Black Galaxy granite countertops with breakfast bar area and high-end stainless steel appliances. Enter your master bedroom suite through sliding Shoji doors featuring a custom cedar lined walk-in closet with built-in wall-to-wall shelving. Luxury spa-like master bath with dual vanities with vessel sinks, granite countertops and designer ceramic tile walk-in shower with multiple high pressure shower heads. Second bedroom/den and full bath with vessel sink, granite countertop and ceramic tile walk in shower. Numerous upgrades including: NEWER LG washer and dryer in unit; upgraded HVAC equipment, custom painting, LED lighting, cedar lined closets and window treatments throughout. If desired, the unit will come partially furnished including antique teak furniture, Le Corbusier couch and chairs, Bose entertainment system and 50-inch flat screen TV. Elevator condo building amenities include concierge, outdoor pool, tennis courts, exercise rooms/fitness center and two party rooms. Quiet, mature natural surroundings yet close to everything that Bethesda has to offer within walking distance to the Montgomery Mall and Ride-on bus to Metro. Conveniently located near commuter routes including Democracy Blvd, I-270 and I-495. Rent includes all utilities and free unassigned parking in front. No pets allowed in the building. (garage parking may be available for additional $200 per month).